You wouldn’t think said response would sum up relationships so well, but then again, The Lobster doesn’t do anything normal. It sets itself up for such an odd premise in an attempt to show what odd constructions the real world sets for itself regarding relationships. The hotel and the rest of the film has such strict rules that makes for an interesting watch and constant reminiscing. The Lobster is not an easy watch. Every character talks like they’re acting bad on purpose and the slower pacing and nonsensical nature of this world Yorgos Lanthimos created I imagine would be daunting to most. Even as a lover of film I was tempted to bash it while watching it. It’s not a terribly pleasant viewing experience. Yet, the more I sit with it and think about, the happier I am that I saw the film. I enjoyed the points Lanthimos was making and the way he made them. While I could get bogged down in the details- like how a hotel designed to pair people couple together in 45 days would look nothing like the hotel seen in the film- it would mean that I am missing the forest for the trees. The point of The Lobster is not necessarily to tell a coherent short-form story, its purpose is to point out the absurdities of societal norms and constructs we have regarding dating and relationships. 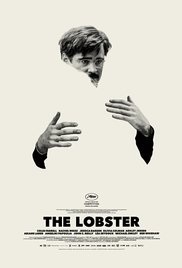 The Lobster ends up also being a great showcase for Colin Ferrell. After beginning his career being pigeon-holed as a traditional leading man by Hollywood (see: SWAT, The Recruit, Alexander) after decent turns as the antagonist in major motion-pictures (Daredevil, Minority Report), Ferrell has redefined the second half of his career in a wonderful way. After teaming up with writer/director Martin McDonagh in 2008’s In Bruges (and later again in 2012’s Seven Psychopaths), Ferrell showed the world that he’s not your traditional leading man. Ferrell works best when he can act oft-kilter or when he’s playing second fiddle. His unique turn in even a big budget project like Horrible Bosses helped prove that Colin Ferrell is a great character actor stuck in a leading man’s body. Ferrell even took some of his looks from his Horrible Bosses character (mainly the gut) to play his role as David in The Lobster. Ferrell carries the film like he can, but between this and In Bruges, Ferrell is telling the world that if you want me to be great in your movie, you need to make it delightfully weird. And The Lobster is delightfully weird. Its off-putting comic sensibilities can be, well, off-putting, and it could easily be viewed as pretentious to the average movie viewer (albeit probably true). However, if you let it, The Lobster is a thought-provoking tale about courtship and societal mores. While I may not felt this way while watching viewing the film, ultimately, I’m glad I saw The Lobster.